Just when I think I am going to be responsible and eat my packed lunch, someone goes and puts a bag of TGI Friday's "Buffalo Sticks" in the office vending machine. Despite the fact that I had a good idea what they were (Flamin' Hot Cheetos), the name still conjured up images of long-forgotten Native American delicacies. I opened the bag and an odor came blasting out -- one that made me rethink my Flamin' Hot Cheetos hypothesis. It smelled kinda ranch-y (like the dressing, not poop on a farm). I extracted a curved, pockmarked red formation from the back and realized that it was more similar in consistency to a puffy Cheeto, and I wasn't sure if they made those Flamin' Hot. My research suggests they don't. It also suggests that Saddam Hussein loved puffy Cheetos -- yet another reason for me not to like them. Would I have a reason not to like Buffalo Sticks? The first bite was tangy like the sun-ripened buttermilk used in ranch dressing. This rotting milk flavor is followed by the texture one would experience if one were to somehow dry out one of those foam packing stubs that dissolve in water. Next up is a warm sensation in the mouth that precedes a slight burn that diminishes in strength with each log consumed. The flavor "burnt" was also experienced. If you're still having trouble relating, imagine mixing hot sauce with ranch dressing, allowing it to air dry and get crusty and then eating it. This ranch dressing thing was really bothering me. I have a friend from Rochester, NY who claims that people in Michigan love ranch dressing and that we even say "ranch" funny. He has not experienced the ranch dressing phenomenon in his home state, and this news makes me long for greener pastures. Furthermore, why add ranch flavor to the "buffalo" (do buffalo graze solely upon hot peppers?) flavor? Everyone knows that if you're a wuss, you need ranch dressing to cool your palette after eating some hot wings at the local Buffabro Wildchads. There's not even a picture of ranch dressing on the bag. There is celery, but no celery flavor or celery-derived ingredients are present. 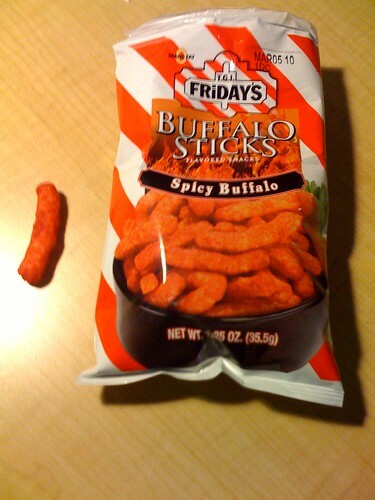 These buffalo sticks definitely missed the mark, but I finished the damn bag any way.